For this Sterling silver bangle I've hand-twisted wire then wound it around a heavier gauge core. Both ends are capped with Hill Tribe silver beads. 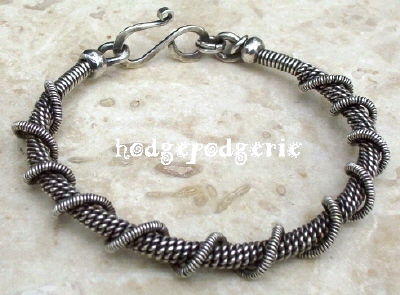 Smaller gauge wire has been coiled then wrapped around the bracelet. 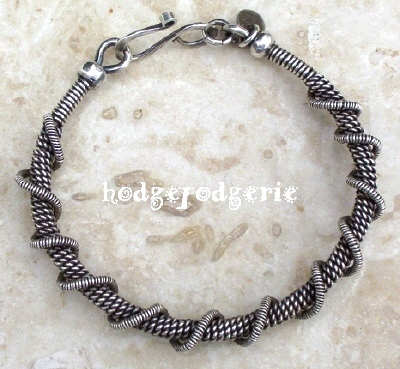 Made with yards of Sterling silver wire, this bracelet has a nice heft that is very comfortable to wear. I've finished it with a handmade hammered Sterling silver clasp and then gave the entire bangle a rich patina, enhancing it's lovely textured design. This beautifully handcrafted Sterling silver bangle would look great on either a woman's or man's wrist. Return from "It's a Wrap Bangle" page to "Bangle Gallery" page.